Looking for a Used Sky in your area? CarGurus has 190 nationwide Sky listings starting at $3,895. 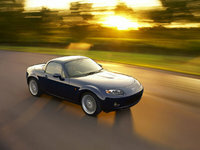 Saturn jazzes up its popular Sky performance roadster for 2009 by introducing three new exterior colors. Evening Blue and Ruby Red, as well as Hydro Blue, available on a limited basis, replace the previous year's exterior colors. In addition, Saturn offers the Sky in two new promotional trim packages, the Ruby Red Limited Edition and the Hydro Blue Limited Edition, for 2009. Saturn also adds new 18-inch, five-spoke painted aluminum alloy wheels to the Sky's list of standard features, and includes Bluetooth hand's-free telephone connectivity with the Sky's OnStar system. Other than that, the Saturn Sky carries over from the previous year largely unchanged. Now in its third year of production, the Sky retains its distinctive, European-influenced exterior styling and still rides on GM's global rear-wheel-drive compact performance platform, which it shares with a number of other vehicles, including the Pontiac Solstice. Exterior design features include a low-slung stance, hood vents, a pronounced front fender center peak, a deep front air intake, and a chrome front bar with an integrated Saturn badge. As in previous years, the Sky comes in two trims - the base Sky Roadster and the more powerful, better-equipped Sky Red Line. A 173-hp, double-overhead-cam, 2.4-liter four-cylinder Ecotec engine powers the base Roadster. It features variable valve timing and electronic throttle control, and generates 167 lb-ft of torque. Stepping up a notch, the Sky Red Line retains its turbocharged, 2.0-liter, direct-injection four-cylinder Ecotec engine, which produces 260 hp at 5,300 rpm and 260 lb-ft of torque, making it the most powerful production engine in the Ecotec family, according to Saturn. Both engines link to a five-speed Aisin manual transmission with a short-throw shifter, which comes standard, or an optional five-speed automatic. Standard features include a leather-wrapped steering wheel with audio controls, power windows and door locks, power exterior mirrors, reclining bucket seats with accent stitching, remote keyless entry, and a six-speaker AM/FM audio system with a CD player, MP3 connectivity, and XM satellite radio. OnStar also comes standard, with Bluetooth standard on the Red Line trim (it's available as an option on the base Roadster). In addition, the Sky comes equipped with a sound-insulated, manually operated cloth convertible top. The Red Line trim adds performance suspension tuning, front brake cooling vents, high-performance radial tires, silver fender vent accents, and dual polished aluminum exhaust tips, as well as a leather shift knob and unique Red Line gauges on the instrument panel. To ensure a firm, stable ride and rigid chassis, the Sky uses a hydroformed tube structure that reduces body flex. A rack-and-pinion hydraulic steering system provides responsive handling, while the four-wheel independent suspension and Bilstein monotube shocks provide a sporty ride. Antilock brakes, a limited-slip differential (standard across the line for 2009), StabiliTrak stability control, and projector-beam foglights also come standard, while options include a decklid spoiler, leather seat trim, and a premium Monsoon audio system. What's your take on the 2009 Saturn Sky? Have you driven a 2009 Saturn Sky? Price is accidentally showing 4K plus and should be starting at 14,800.